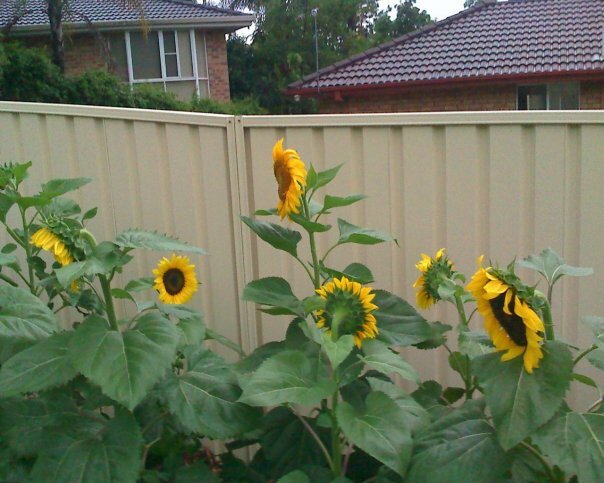 A few months ago I had this idea - a Van Gogh inspired vision - of sunflowers along the back fence. 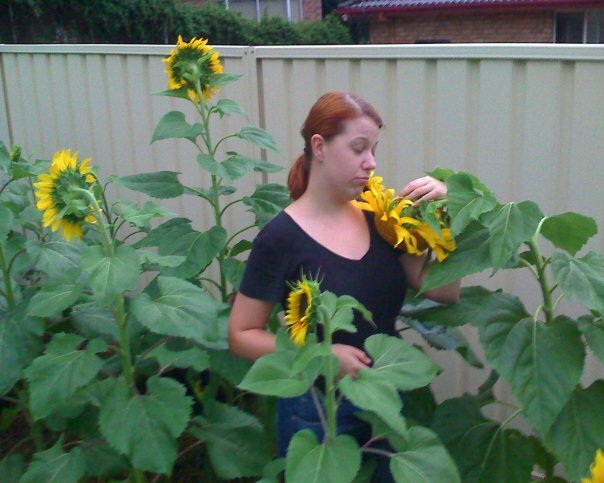 I had seeds for both Giant Russian and Yellow Pollenless sunflowers and planned a double row, with the 3-4m tall Giant Russians at the back with the shorter 1.5m tall Yellow Pollenless in front. I could picture the magnificent image in my head so clearly. 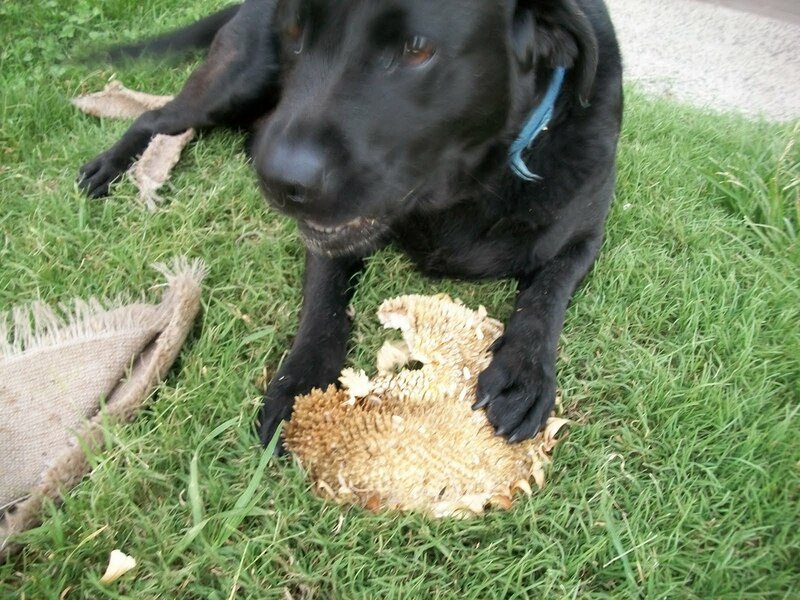 The first issue I encountered was a logistical issue. Our back fence has been steadily falling down, not helped by the fact that our two dogs and the dog that lives behind us like to try and play together and scratch and push at the palings. 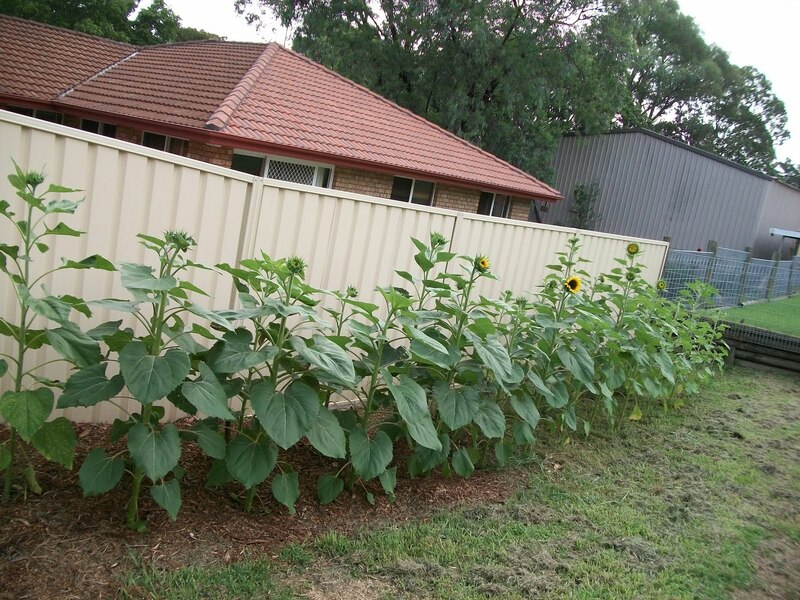 So we had a chat to the people behind us and agreed to replace the aging wood paling fence with a colorbond fence. 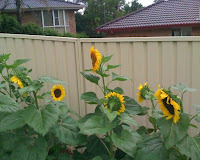 Which meant that I needed to hold off planting anything in front of the back fence until it had been replaced (unless I wanted my sunflower seedlings trampled). We asked the fence guys to leave the old palings in our yard. We plan to reuse them to make a nicer vegie patch and compost area fence. The planting was done in an afternoon in December. First we mowed the strip along the back fence. As the soil is heavy clay, we decided to dig holes and fill them with compost to get the new seeds a good start on life. 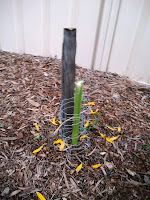 After the seedlings started to emerge, we realised that they were at risk of getting squashed or trampled by the dogs, so I made some wire mesh collars to give the ones in prime "trampling" zones a little bit of protection. Then as they were also getting some stiff competition from the grass, we started to mulch around them using wet newspaper to smother the grass first before laying the mulch on top. Unfortunately we only had enough mulch to half the row, so it looked a bit odd for a few weeks. 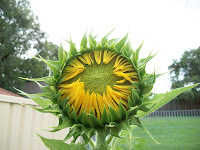 By the end of January the sunflowers were starting to bloom and were looking gorgeous. Once we got another trailer load of mulch, courtesy of Mum & Dad having some trees lopped and a gigantic pile of mulch, we finished mulching the row around the end of February. 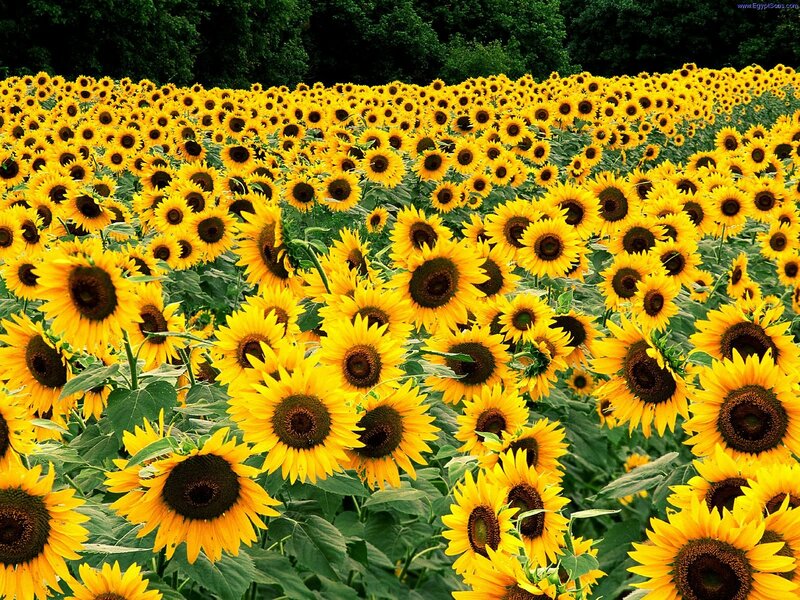 Once open, the sunflowers were truly beautiful to behold. 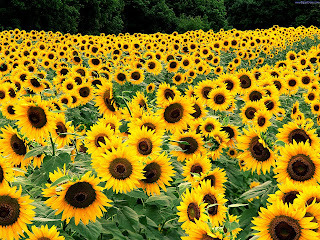 The bees certainly loved the big giant russian flowers. The yellow pollenless put out little mini sunflower side shoots, often with "double-heads". Sadly our sunflower joy was rather short-lived. 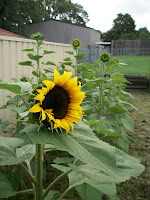 The first issue was that the sunflowers seemed to struggle to hold up the weight of their heads. 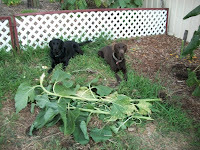 We're not sure if this is a nutrient deficiency or perhaps we were growing them at the wrong time of year. The giant russians in particular needed some propping up (or perhaps a hug), while the rest just looked a bit droopy and depressed. And on overcast days, they seemed a bit confused about which way to face. 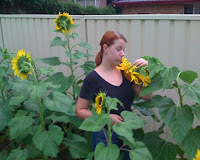 Then we discovered we weren't the only ones who enjoyed sunflowers. The local population of sulphur-crested cockatoos had discovered the tasty buffet in our backyard, We thought of the Woolworths ad when the the woman yells to her husband "Stavros!" when the cockatoos are on their vegie patch. 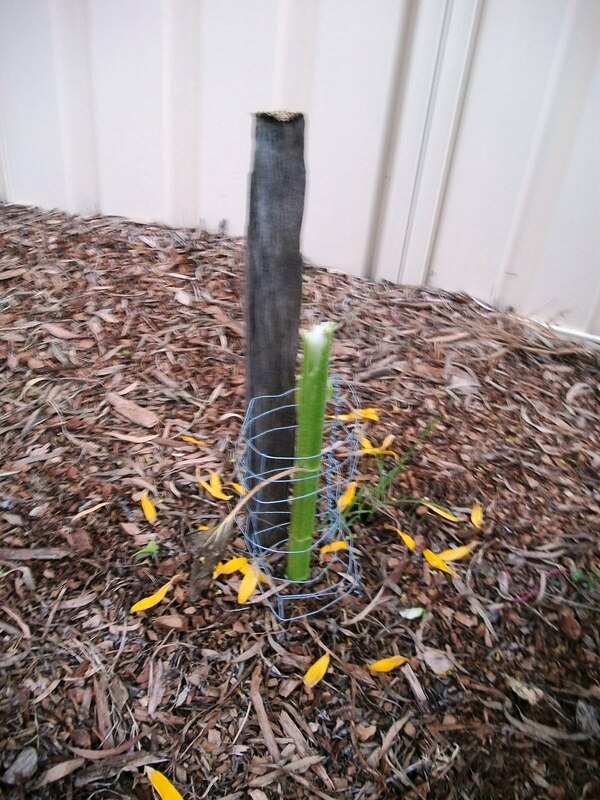 Sadly the back fence was a bit too far away from our kitchen window to rig up a scare mechanism (though the CPD was tempted to try), so we tried training Hudson to chase the cockatoos off the flowers by yelling "Stavros!" out the window. Can't say it worked particularly well, though once pointed out, he gave a good show of chasing them. 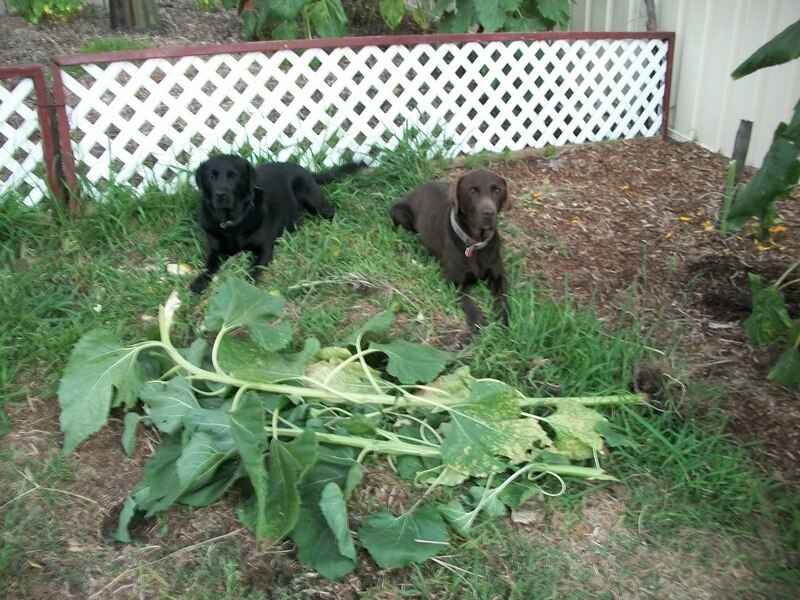 And while the cockatoos started the demise of our sunflowers, their fate was doomed once the dogs discovered that sunflowers are tasty and jumping up, grabbing the heads, and pulling them out of the group or snapping them off was a great new game.